Green, Green, and More Green! Gotta Love St. Patty’s Day! What could possibly make St. Patrick’s Day any better when you already get to wear green, act a bit crazy, drink lots of beer, and eat your weight in corned beef, cabbage and potatoes? You guessed it! Cupcakes! 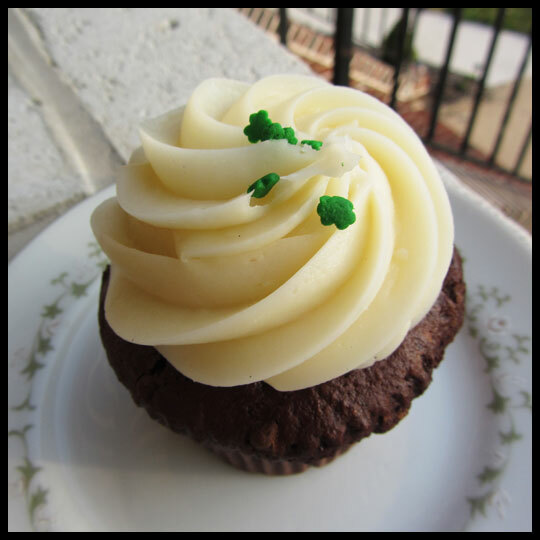 Local bakeries and cupcakeries seemed to have a ton of fun this year with St. Patty’s Day offering everything from Chocolate Mint, Green Velvet, Irish Cream, Guinness, and even Corned Beef and Cabbage cupcakes. Below is a sampling of some that the Crusaders were fortunate to try! This cupcake screamed “GUINNESS” and “BAILEYS!” The cake was moist and rich, and the frosting was not sweet, but instead, it was buttery and very booze-infused. I’ve had several cupcakes from Hamilton Bakery, and this is my favorite so far! 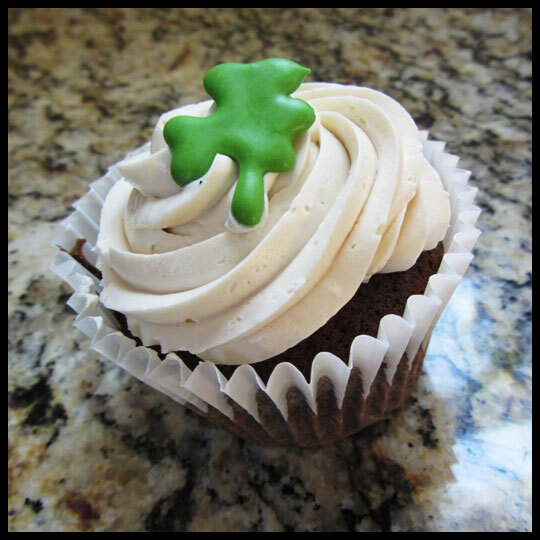 Kupcake & Co. paired their amazing chocolate cake with a sweet and smooth Irish Cream frosting. 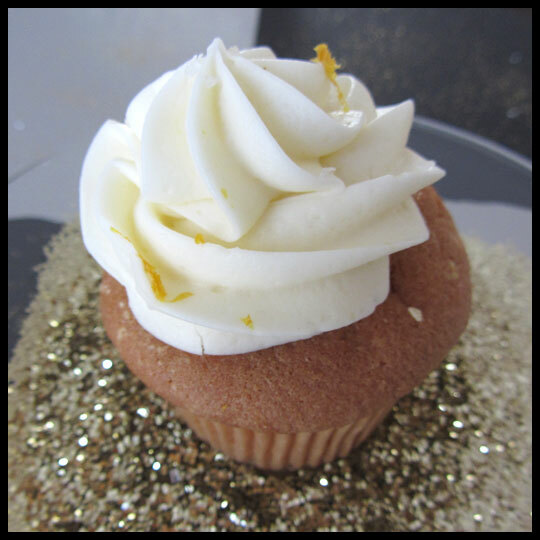 The frosting was so flavorful that there’s no need to sit down with an after dinner Baileys on the rocks when you have this cupcake. 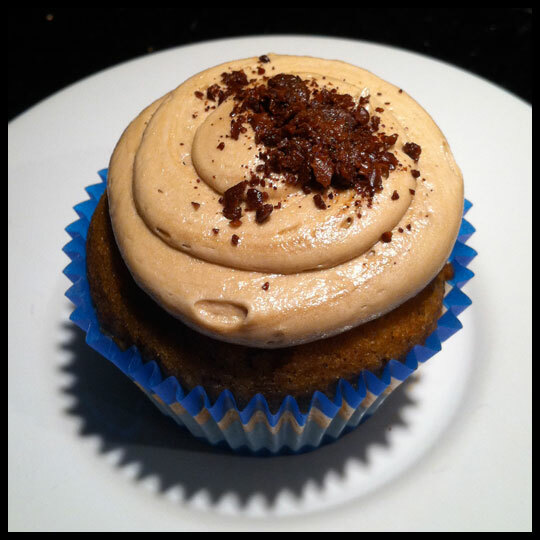 Some may argue that this is not a real cupcake due to its savory nature, but as always Starry Night stepped outside of the box and offered up something different. 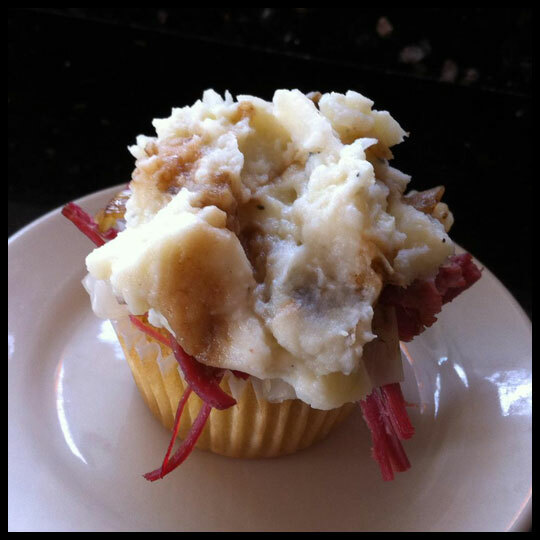 This Smithwicks cupcake was topped with corned beef in a Guinness glaze and finished with whipped potatoes & cabbage. Crusader Jenn said that it was the perfect pre-dinner appetizer! 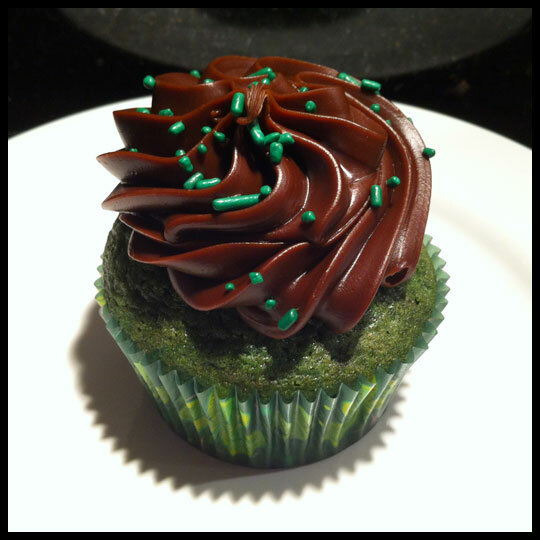 We hope that you were able to enjoy some fun green-themed cupcakes this St. Patty’s Day! If so, share them with us! 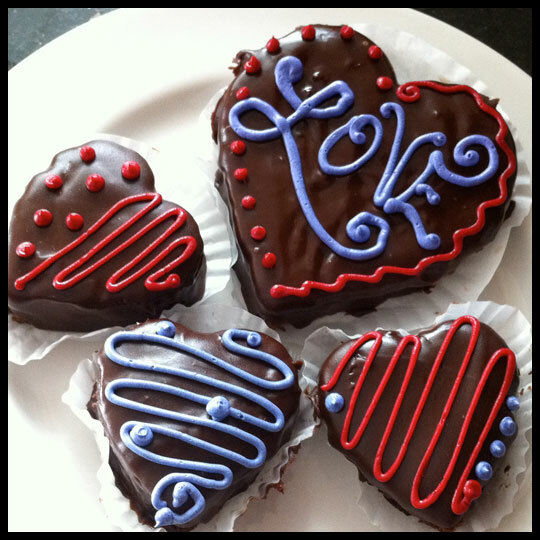 Despite all the cupcakes I’ve been surrounding myself with in preparation for Valentine’s Day, when I heard Starry Night was offering their “famous” chocolate raspberry ganache hearts, I wanted one. Try as I might to resist, I quickly gave in to Crusader Stacy’s peer pressure and pleas for me to bring her one. I caved. Of course I couldn’t get just one! I decided to get the large heart for my sweetie and I to share. Then, since I was getting one for Stacy, I decided that my big sister, Alissa, and other “sister,” Crusader Elisa, also deserved a special, edible valentine. What do you like to give for Valentine’s Day? 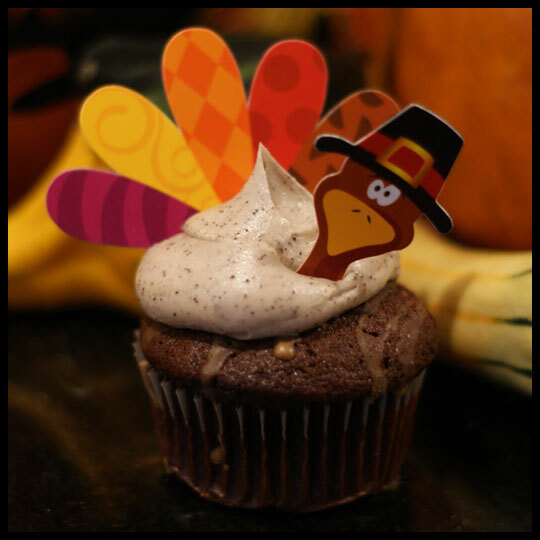 Are edible treats in your holiday plans? With the Super Bowl yesterday, it was a big weekend for parties. 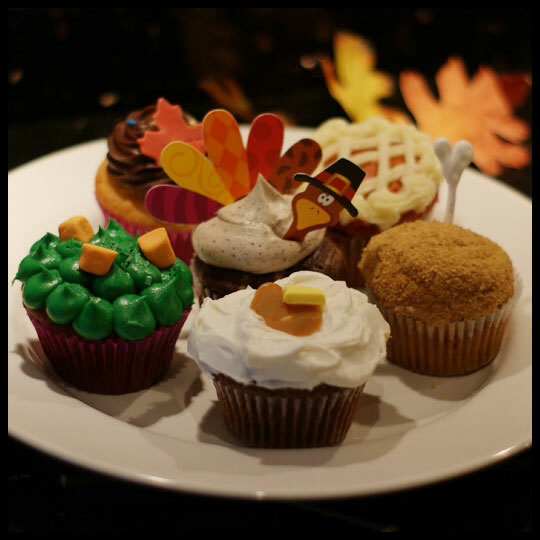 And we know what that means…CUPCAKES! This was no exception for the Crusaders. Many places were offering Super Bowl themed cupcakes, so we got out to make sure we had a few ourselves. Starry Night Bakery and Coffee House not only had their cupcakes decorated with hand-drawn candy footballs and XLVIs, they were also offering a new flavor…Hot Chocolate! After having a few hot chocolate cupcakes from other bakeries this season, I was very excited to try this flavor from one of my favorites. And it didn’t disappoint. The moist chocolate cake was complemented with a marshmallow filling and what I believe was a marshmallow buttercream frosting. I hope they keep it on the menu through winter, because I’ll be needing another one! When Crusaders Stacy and Elisa heard that Pirate Cupcakes created a spicy chocolate cupcake specifically for a Super Bowl chili cook-off that was taking place at Captain Larry’s in South Baltimore, they knew they had to try it. According to Stacy, “The rich chocolate cake was moist but WOW there was a ton of heat after the first bite!” This cupcake was also filled with pepper jam and topped with cream cheese frosting. The cream cheese frosting was sweet and delicious, but unfortunately did nothing to cool the burning left behind. 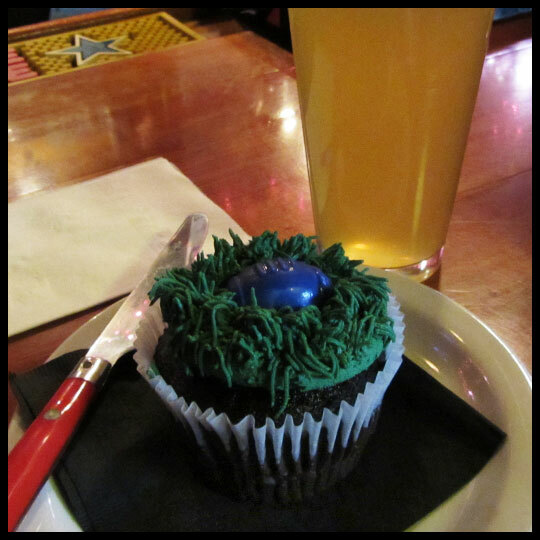 This cupcake definitely requires a cold beer immediately after sampling. Elisa and Stacy just couldn’t handle the spiciness and decided that they will return to try some of Pirate Cupcake’s other, non-spicy, cupcakes. 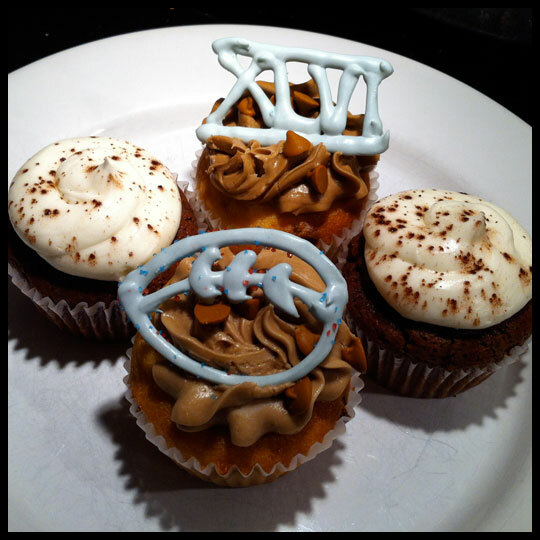 Did you have any cupcakes during the Super Bowl? Were any more on the savory side? 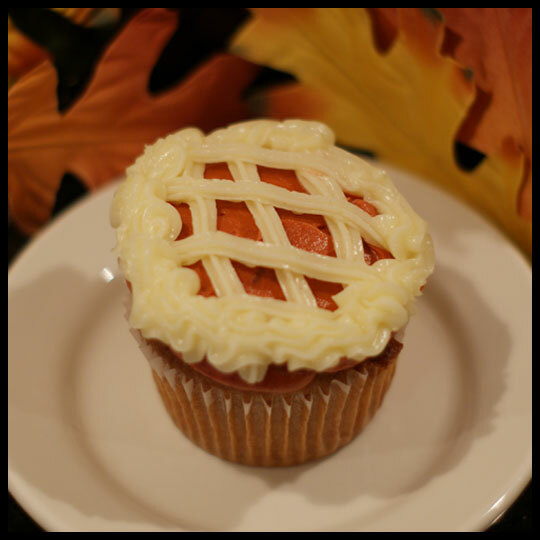 Do you like savory cupcakes, or do you prefer them to stick to their roots as a sweet treat? When I found out that one of my favorite local bakeries, Starry Night Bakery and Coffeehouse, was introducing a new flavor, Cinnamon Chip, I just HAD to get down there and check it out! The other crusaders couldn’t resist either, so with a great “buy 1 get 1 free” deal, I stocked up for all of us. And I’m so glad I did! Throughout many trips to Starry Night, I’ve been able to try some of their other cupcakes as well. One of these tasty treats included a cupcake they call Voodoo. The Voodoo is an espresso cake with caramel buttercream, what I think is a chocolate filling, and topped with shaved chocolate covered espresso beans. 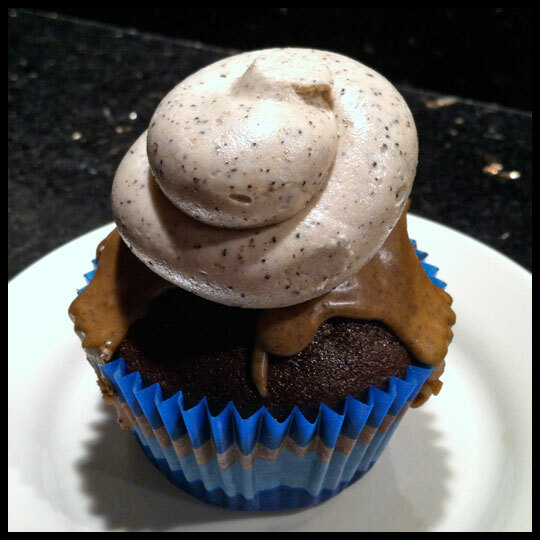 As usual for Starry Night, this cupcake has moist cake and bold flavors. I highly recommend it for coffee enthusiasts. 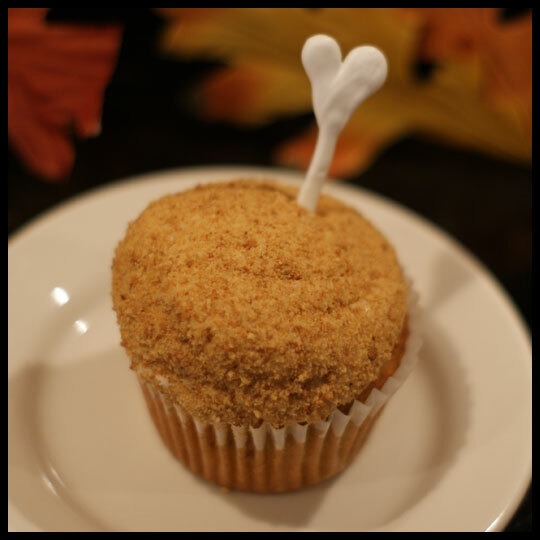 On another visit, I decided that I should to venture out of their “Quirky Cupcakes” and into their standard cupcakes, so I picked up a toasted coconut. 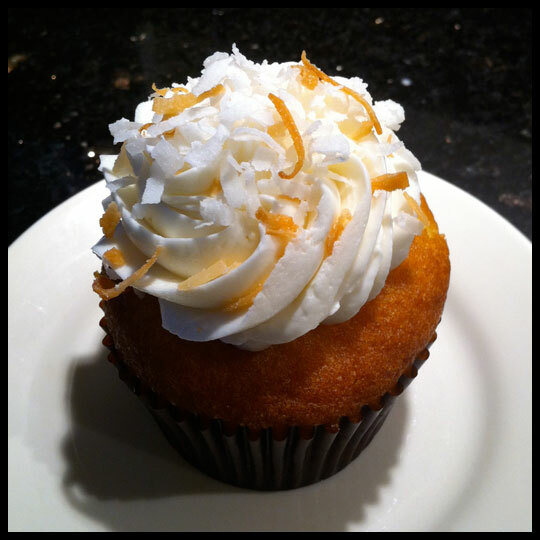 This cupcake was good and I appreciated the sprinkling of regular and toasted coconut shavings on top. However, it wasn’t quite up to the standards I place on Starry Night because it wasn’t packed full of coconut flavor, like I expect from a cupcake. 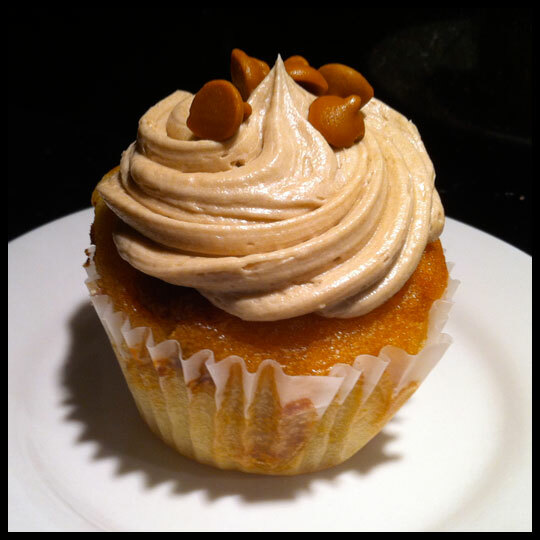 So I guess I’ll just have to stick with the “Quirky Cupcakes,” because WOW, they are good! Ringing in the New Year with Cupcakes! As I’m sure you all know, there is no way the Cupcake Crusaders could have celebrated the New Year without cupcakes. 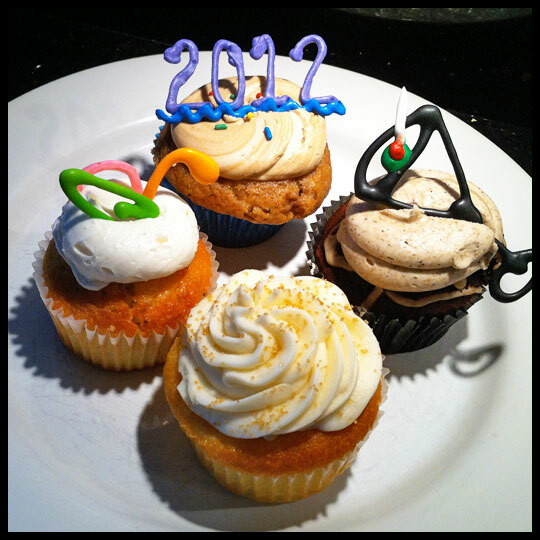 Below are reviews from two of our local favorites that offered New Year’s Eve specific cupcakes. When I heard of all the cupcake shops making Champagne cupcakes, I knew I had to get my hands on at least one. Lucky for me, Kupcakes & Co. did not disappoint. They announced that they would have Champagne, Strawberry Champagne, and Mimosa cupcakes for two days only, so of course I was there on day one. 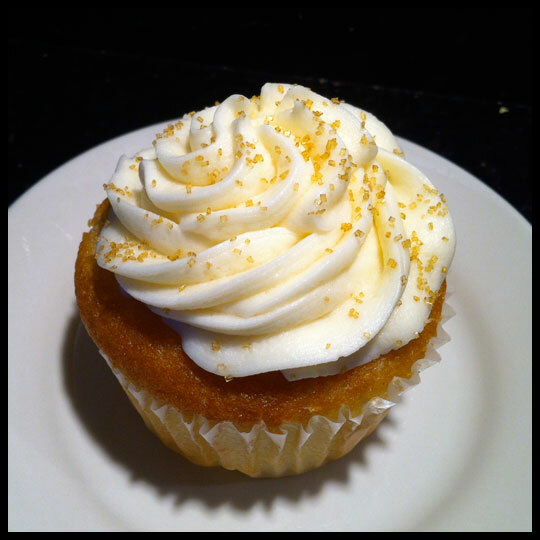 Elisa did an amazing job describing this cupcake: “Bravo for a spectacular champagne cupcake! 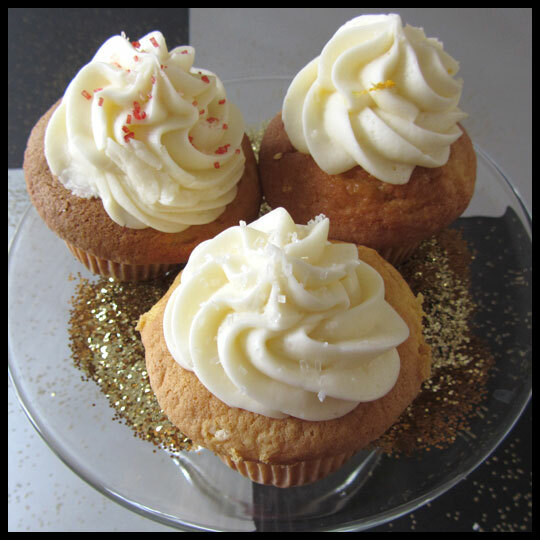 With light moist cake that gave you a hint of brut and smooth creamy icing that did the same, this cupcake really embodied a toast to the new year! 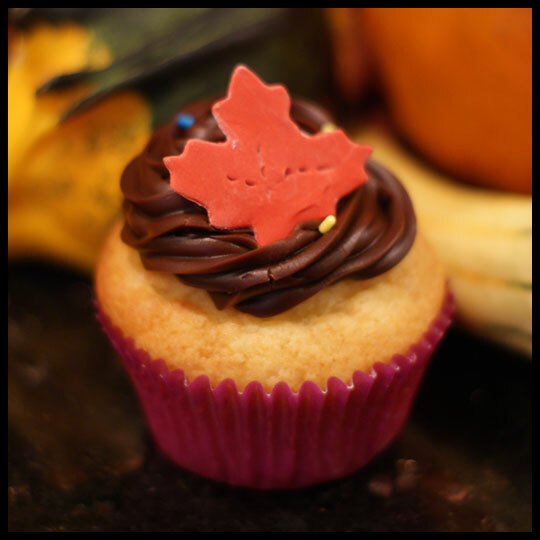 I loved the chunky sugar on top too, just a small sprinkle went a long way to add another texture to this cupcake. 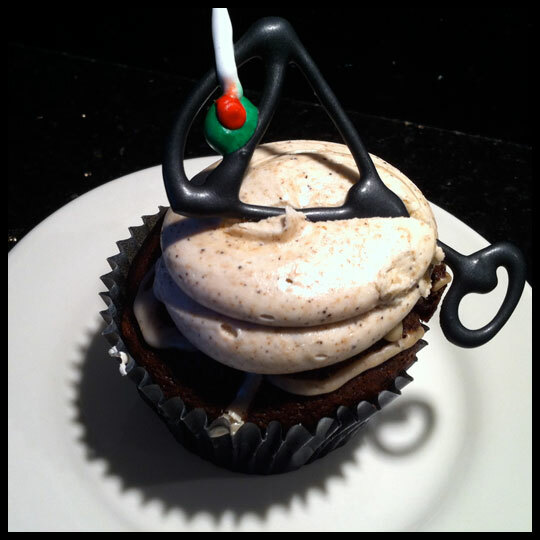 I’d love to eat more of these and can’t wait to try more drink inspired cupcakes from Kupcakes and Co.” I couldn’t agree more. 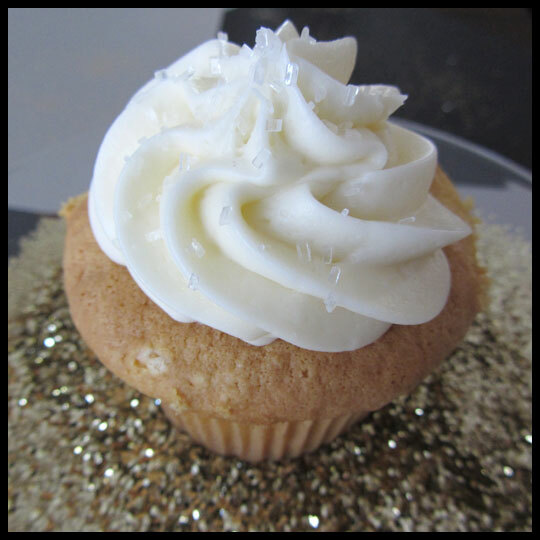 I’m slightly obsessed with their Egg Nog cupcake at the moment (I’ll be so sad to see it go) and this Champagne cupcake was on par with that. Their Hot Chocolate cupcake is also amazing, so they really seem to have a good grasp on how to turn a beverage into a cupcake. This moist strawberry filled cake was topped with the same creamy frosting as the basic Champagne cupcake, and the pairing was amazing! There were actual chunks of strawberry in this cake which made the experience that much better. The sweet cake combined with the dryness of the frosting was a perfect balance. Our second review is from Crusader Jenn. She stopped by Starry Night Bakery and Coffeehouse knowing they wouldn’t let her down. When I found out Starry Night was offering New Year’s Eve inspired cupcakes, I knew that I had to head over there and pick up something special for the night. I’m so glad I did! Their cupcakes were decorated beautifully and made our night-in feel like something worth celebrating. 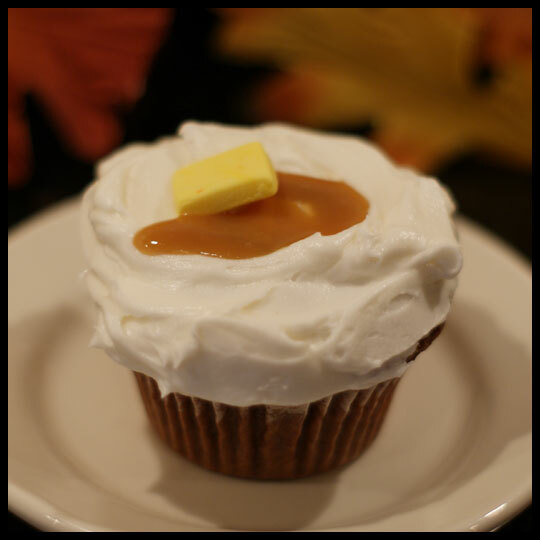 Already knowing how amazing Starry Night’s maple buttercream is from their fall seasonal Pumpkin Maple cupcake, I was really excited about this cupcake. The spice cake was perfect and the handmade candy “2012” so exciting! 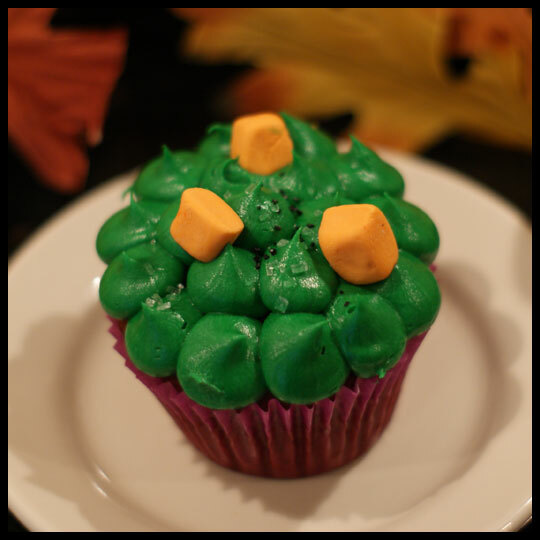 This cupcake was very similar to Starry Night’s Mahoo Wahoo, which we reviewed during Thanksgiving. The Mahoo Wahoo has been a favorite of mine due to its coffee punch with moist chocolate cake. Their Chocolate Whiskey topped with coffee buttercream was no exception. Although you can’t really taste the whiskey in the cake, it made the cake a little richer and moister. The hand drawn candy martini glass added to the top was so festive for the night! 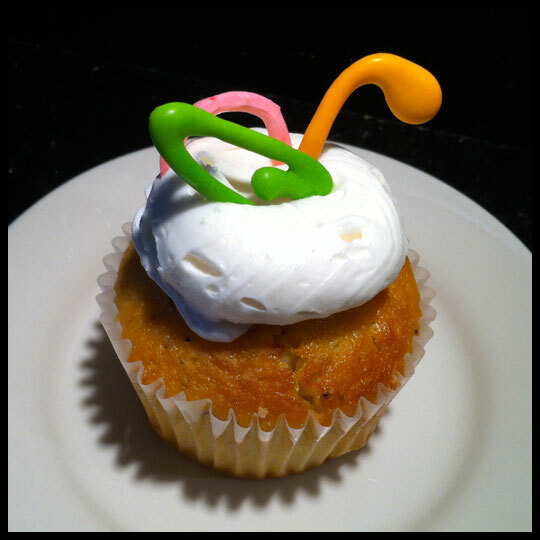 This cupcake was another Cupcake Wars contender, minus the guava frosting. Since our original review it’s been a favorite of mine, but hasn’t been on the menu for the fall. However, with the theme for the night being high energy, Starry Night brought it back! I missed the guava buttercream, however since the cake is amazing I was happy to at least get another taste of it! It being the New Year and all, you can’t celebrate without some Champagne! Starry Night opted to keep the champagne in the cake and not the buttercream frosting, so the champagne flavor didn’t really come through but did make the cake super moist! 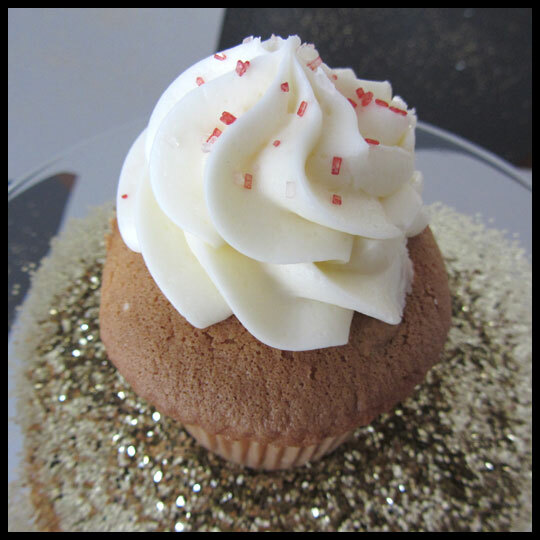 The raspberry jam was in just the right proportion, so it didn’t overpower the cupcake and the champagne colored sprinkles added elegance to the cupcake that one associates with drinking champagne. 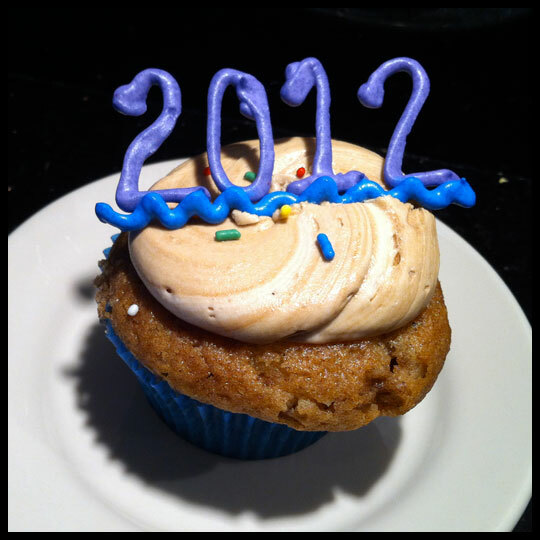 We hope everyone had a fantastic New Year’s Eve, with or without cupcakes! 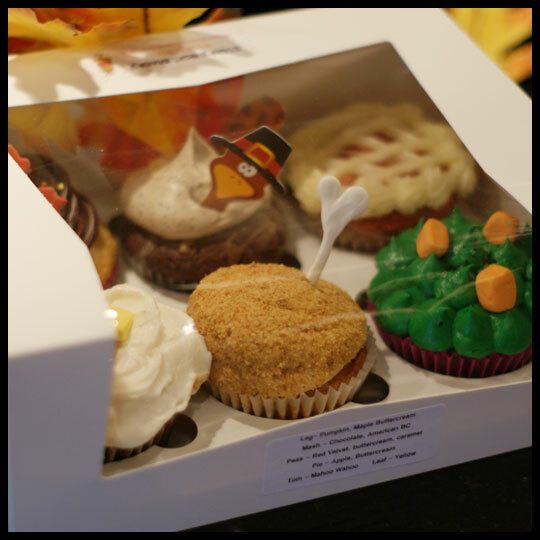 If you did have some cupcakes that are worth mentioning, please let us know, we would love to hear about them!